Trail Talk – Winter 2018. 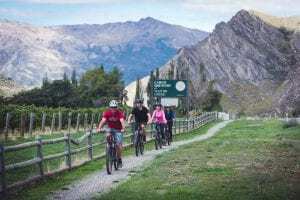 Well well well, another summer season has drawn to a close in Queenstown and here at Around The Basin Bike Tours we have moved onto our winter schedule. Today has dawned with fresh snow coating the hills around town and it is certainly starting to look and feel like winter. Let’s hope for a great ski season, with a good bit of biking also thrown in the mix! The exciting news this winter is that we will be running our Bike The Wineries Half Day Tour right through the winter season! This will allow people on a tighter time budget to still experience the simple pleasure of riding through the wineries. A truely magic experience on a calm, crisp, clear winters day. This tour goes out at mid day, really maximising the warmest weather window during winter. 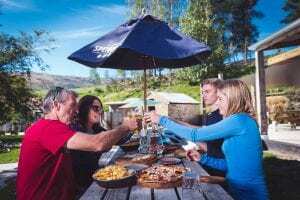 We always encourage people to book the Full Day Wineries Tour if possible, as the added hours allow you to see Arrowtown and ride an extra 15 km along the stunning Arrow River Bridges Trail, giving a great balance between riding, exploring and wineries. But if riding less and drinking more sounds like you, then the Half Day Tour is perfect! As usual, we will also be offering our Bike The Bridges Half Day Tour, Bike Hire and a Shuttle Service right through the cooler months. So if you want to get on a bike in Queenstown this winter, simply give us a bell.